As one of the seven Underwater Wonders of the World*, Palau, Micronesia is a playground of nature’s finest assets both on top of and underneath the surface. With all of Palau’s human and natural resources preserving these special gifts, it’s no wonder that CEDAM International* selected this “’Survivor’ of the fittest” destination as one of our world’s greatest wonders. Palau is one of the world’s largest archipelagos, located in the westernmost corner of Micronesia with 586 islands and about 20,000 inhabitants. Consistently ranked as one of the world’s best dive destinations, Palau is the ultimate paradise for the adventurous traveler, boasting some of the most spectacular water features and beaches. Palau is part of the Micronesian Island chain and is beautifully located just 7° north of the Equator in the western Pacific Ocean. This gives Palau some of the most favorable tropical weather on earth with moderate temperatures and soft ocean breezes all year round. The abundance of marine life is evidenced through the sheer number of healthy species, with over 1,400 varieties of fish, about 300 types of marine sponges and at least 500 diverse coral species. There are only nine known species of Giant Clams in the world and Palau has seven. Many of the colorful reefs lie in unbelievable proximity to dozens of deserted, glistening white sand beaches on the edges of palm-shaded tropical islands. One can simply marvel at the marine life that thrives in Siaes Tunnel, located along the reef where over two centuries ago fate washed up the British Ship, The Antelope, and instantaneously initiated Palau’s first recorded contact with the outside world. In the tunnel, at the entrances to their homes on the sandy bottom, the multicolored and decorative Helfrich’s dartfish and Randall’s shrimp goby thrive can be found. On the other side of the tunnel, is a sheer drop off that is domicile to impressive schools of hump-head parrotfish, Napoleon wrasse and dazzling soft corals. There may even be a leopard shark resting against the wall of its numerous small caves. In its many shallow-water canyons, there are bi-color blennies, lionfish, black-spotted puffers, unicorn fish and triggerfish. And the list goes on. Transparent waters bequeath underwater visibility beyond anyone’s imagination. So much so that from the most immaculate shorelines in the world, a boat 50 meters beyond creates the magical illusion that it floats merely on air, with its conspicuous shadow cast on a translucent seabed a few feet beneath. A prism of colorful coral reefs and a virtually limitless variety of sea life set the stage in this tropical paradise. From beginners and intermediate to expert divers, there are over 50 existing dive sites, each possessing distinct characteristics and individual personalities to appeal to everyone’s desires and abilities. Chandelier Cave, for instance, is a sub-surface catacombs of rooms filled with massive, ancient icicle-shape stalactite deposits that simultaneously hang from the ceilings of cavernous openings. 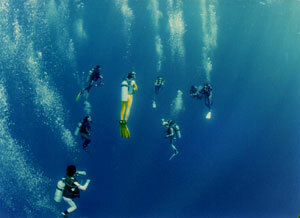 Experienced guides ensure measures are taken to adroitly negotiate the dives that result from this shallow-water, yet challenging diving experience. The Ngemelis Wall, is commonly known as the Big Drop-Off and has been declared by diving’s immortal icon Jacques Cousteau to be the best wall dive in the world. Its precipitous 1,000 foot drop bestows a profusion of intriguing sights of soft corals and reef animals, while its upper portion is encrusted with a rainbow of multi-colored sea fans, sponges, coral whips and soft corals. Blue Corner, arguably one of the best in the world and the most famous of Palau’s underwater attractions, boasts constantly cruising gray reef sharks searching the rich waters for their prey. Insatiable photographers, their excitement masked considerably by the slow motion pace of underwater movement, train their equipment and snap away at schools of barracuda, giant resident Napoleon Wrasse that often reach six feet in length, snappers and butterfly fish. The dense concentration of marine life is revealed as these countless underwater fruits of nature dart in and out of a scintillating panorama of hard and soft corals that house them. And they are but a fraction of the more than 1,400 species of coral that thrive in these extraordinarily clear waters. The famed Siaes Tunnel, with its enormous cavern bathed in ethereal blue light and peppered with sea fans and ancient bushes of black coral, is an unparalleled aesthetic dive. On its spotless, white sand bottom can often be seen whit tip reef sharks and black spotted stingrays slumbering. On the east side of Palau Lagoon is a site known as the Ngerchong Coral Gardens, famous for its fabulous variety of intricate coral formations and high concentrations of small, schooling reef fish. Splendid waterfalls such as the largest one on Palau, Ngardmau Waterfall, can be reached after a serene trek through the jungle, amidst indigenous flora and fauna. Each presides majestically over their respective natural domains, and along the way, captivating endemic birds and plants proliferate. 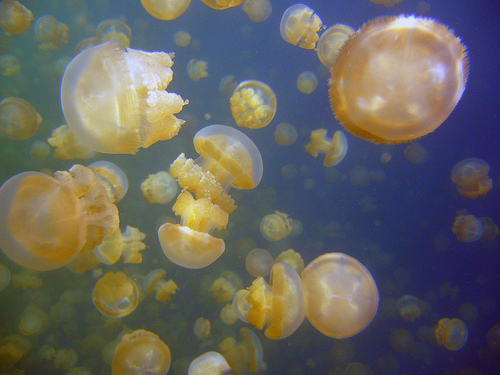 Natural preserves most can only dream of also include the daring and the unusual – like Jellyfish Lake, where two types of jellyfish can be found, namely the golden jellyfish known as Mastigias and the moon jellyfish known as Aurelia. This intriguing lake departs radically from convention for it is an enclosed body of water wherein, over the course of millennia, resident jellyfish have become virtually stingless, allowing adventure seekers a rare opportunity to swim amongst these truly unique water creatures.In order to access this unique adventure, visitors will need to enlist the transport of a local tour guide at one of the tour shops operating in Palau. The Rock Island and Jellyfish Lake entry permit is $35 per person in addition to the tour package. It’s recommended that visitors sign up for the full day excursion, which includes snorkeling, lunch in the Rock Islands and a trip to nature’s spa…the Milky Way. Diving is a year-round adventure in Palau and during the busiest season, from January to April, divers will witness spectacular sights such as migratory whale sharks passing by, sharks or mantas mating and large schools of fish spawning. And as for the “icing on the cake,” shark enthusiasts will enjoy a shark themed week full of adrenalin-packed activities as the Micronesian Shark Foundation (MSF) holds its annual shark week at Palau’s Fish ‘n Fins dive shop in March of each year. The Micronesian Shark Foundation is a Palauan-based, non-profit foundation whose goal is to research and monitor the many sharks of Palau as well as collect scientific shark data. Between February and April, hundreds of grey reef sharks migrate to the waters of Palau to mate. This generates a fabulous opportunity for shark lovers to dive with the world famous sharks of Palau and to participate in data collection, which is invaluable in the study of migration and behavioral patterns of the sharks in these waters. A special cove the locals call the “Milky Way,” the bottom of this little bay consists not of sand but of white limestone mud, which gives the water a milky sheen. Rumored that the mysterious chalky mud makes an excellent rejuvenating facial, guides dive off before the boat is even anchored, head down to the floor of the cove and return with a huge handful of the white muck, which they instruct their passengers to cover themselves with. After soaking in the sun,while the clay dries and the minerals work their magic, it’s time to jump in, rinse off and relish in the natural body scrub that is said to garner hundreds of dollars in some of the world’s best spas. While many destinations feature amazing assets, the effect that Palau has on its inhabitants and visitors alike is profound. This enchanting land is a tropical paradise of nature’s greatest gifts.